It’s almost fall and apples are ripening, especially in the Rattlesnake where they are the number one bear attractant (Merkle, Krausman, and Booth 2011). In fact, if you look at the map of bear conflicts in Missoula (http://missoulabears.org/resources/maps.html), the Rattlesnake appears as a massive glob of bear incidents. Biologists have even found that there is a direct correlation between the time of apple availability and the shorter distances bears forage from houses in the area (Merkle, Krausman, and Merkle 2012). Currently, black bears are the species that come into Missoula and feed upon apples, but a couple of years ago a radio-collared grizzly was detected on the outskirts of the city (Chaney 2013). Only days before that, tribal biologists from the Confederated Salish and Kootenai Tribes had captured her feeding on apples in an orchard on Flathead Lake. Bears are creatures of habit and can quickly become habituated to residential areas if there are an abundance of easy and delicious food options like apples. In such cases, human-bear conflicts arise and many bears become management problems, with repeat offenders possibly euthanized. In the Missoula area, Montana Fish, Wildlife, and Parks receives approximately 130 calls per year from residents reporting conflicts with black bears (Merkle, Krausman, and Booth 2011). 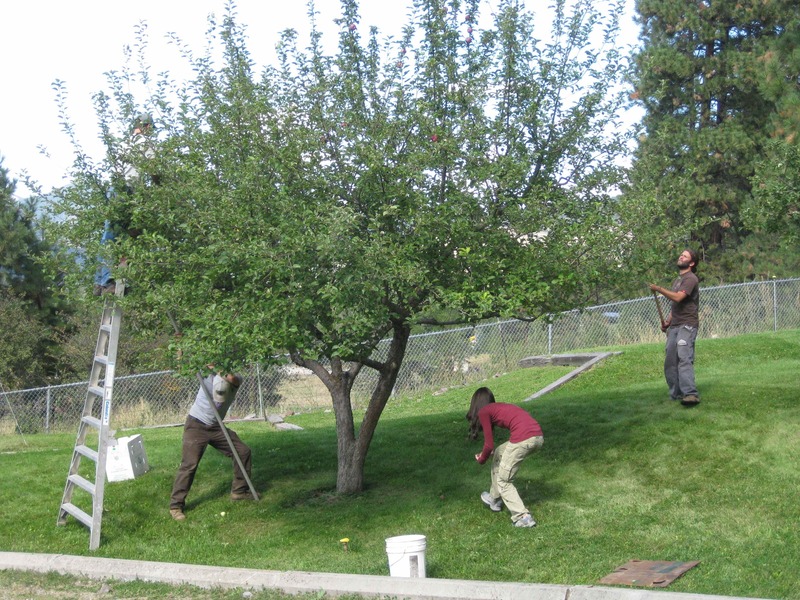 At the Great Bear Foundation, we’re trying to get that number reduced with our Bears and Apples program, which gleans fruit for residents, especially those who are unable to glean for themselves and in areas with previous bear problems. Bears will come into residential areas to feed on apples when natural foods are still plentiful (Merkle, Krausman, and Merkle 2012), so it is really important to pick apples, and other fruit, as soon as possible. Gleaning fruit is hard work and we really rely on our amazing volunteers to help. In return, volunteers are able to take home the fruit that they pick or make cider with our cider press. Any additional fruit is donated or used in compost. If you’d like to help us in our efforts to protect the bears by gleaning, please email or call our Missoula office: info@greatbear.org/406-829-9379. The Bears & Apples Program is funded by grants from the Yellowstone to Yukon Conservation Initiative, Patagonia, and the generous support of members. To donate to the project, visit our membership and donations page. Merkle, Jerod A., Krausman, Paul R., and Booth, Melinda M. 2011. Behavioral and attitudinal change of residents exposed to human-bear interactions. Ursus 22(1): 74-83. Merkle, Jerod A., Paul R. Krausman, and Bethann G. Merkle. 2012. How ‘bout them apples: Insights on reducing human-bear conflicts. Fair Chase Fall 2012: 73-77.